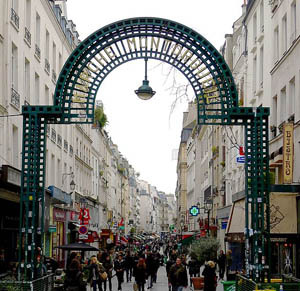 An extremely popular 2nd Arrondissement destination for both tourists and locals is the Rue Montorgueil market street, a five-block long lane between Rue Etienne Marcel to the south (Metro: Etienne Marcel) and Rue Reaumur to the north (Metro: Sentier). Home to more than two dozen specialty food shops, including a patisserie founded nearly 280 years ago by the pastry chef to king Louis XV, Rue Montorgueil is a real treat even if you’re just window shopping (called faire du leche-vitrines in French, which oddly translates to “window licking). Rue Montorgueil is frequented by many neighborhood Parisians that are drawn to the sort of one-stop-shopping mentality linked with the street; in addition to virtually every kind of specialty shop imaginable, there are two medium-sized supermarkets in the area as well as a Picard frozen-food boutique that sells a wide array of high-quality frozen pre-made appetizers, main dishes and desserts. 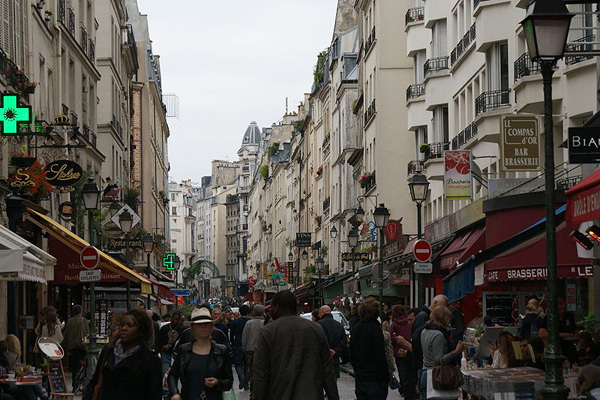 Tourists also flock to the region to get a taste of how real Parisians live and shop (although, truth be told, many of the daily “shoppers”–and most of the folks in the area on Saturdays–are foreign tourists as the area has exploded in popularity over the past few years). And in addition to the multitude of food shops and boutiques, there are several decent cafes and bistros on Rue Montorgueil and its intersecting streets, particularly Rue Tiquetonne and Rue Marie-Stuart, both of which are home to several moderately priced French, Thai and Italian restaurants, as well as establishments specializing in fondue (which is surprisingly difficult to find at Parisian eateries). 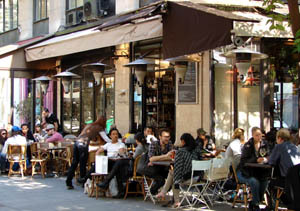 Among the most popular cafes directly on the Rue Montorgueil are La Grappe d’Orgueil, Le Comptoir du Commerce, Le Havane, Cafe du Central and Le Compas d’Or. And 3) If you plan to visit, please note that most of the shops are closed on Sunday and Monday. A la Mere de Famille, 82 Rue Montorgueil. 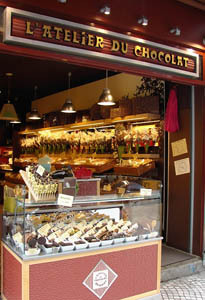 This chocolate and candy shop, founded in 1761 with an initial boutique in Paris’s 9th Arrondissement, is part of a multi-shop chain that today operates 10 outlets in Paris and its suburbs, as well as an online shop. 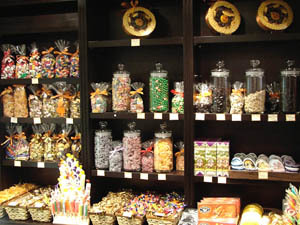 The boutique is renowned for its gourmet sweets that include chocolates and bonbons, candied fruits, chocolate-covered nuts, caramels, butterscotch and homemade marshmallows, among dozens of other products. Boulangerie Collet, 100 Rue Montorgueil. 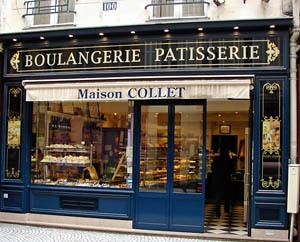 Founded in 1960, Boulangerie Collet has been run by the Collet family for two generations, now helmed by Fabrice Collet and his wife, Mary. There’s often a line at the Rue Montorgueil shop for Collet’s baguette tradition, but the pastries here are out of this world. Try the opera cake or the crispy, light-as-air meringues. And if you’re up for chocolate overload, be sure to order a slice of the black forest cake, covered from top to bottom with dark chocolate shavings. Delitaly, 5 Rue des Petits Carreaux. This family-owned business began with a small Italian deli in the Marais district and has expanded during the past 30 years to include six delis/markets and seven Italian restaurants throughout Paris, as well as an online boutique. 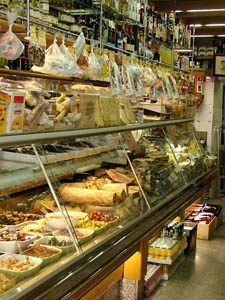 The Montorgueil shop offers a wide range of products from Italy, including fresh and dried pastas, Tuscan olive oil, Italian wines and liquors, and several types of dried meats and fresh cheeses. If you plan to take your purchases out of the country, be sure to select pre-packaged items or request that any fresh products be vacuum-packed for your trip. Eric Kayser, 17 Rue des Petits Carreaux. 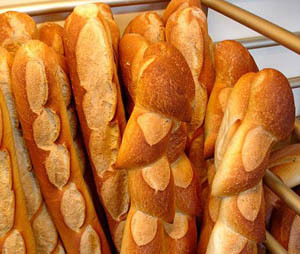 Boulanger Eric Kayser is widely considered one of the best bread makers in the world. And although he opened his first Parisian boutique at age 32 just a little over 18 years ago, Kayser now operates 18 shops in Paris alone and more than 80 around the world. 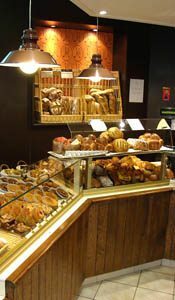 Specialties include the whole-grain loaf pain aux cereals and the baguette monge, a particularly crisp version of the French staple. If you visit, be sure to put your cameras away–photographs are forbidden. La Fermette, 86 Rue Montorgueil. 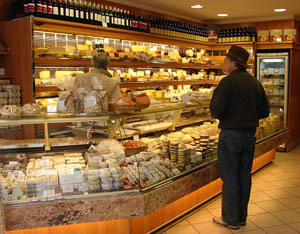 With more than 250 cheese and dairy products available, La Fermette is a must-stop shop for anyone that loves fromage. Try the brie with truffles, the pungent Epoisses or one of the shop’s signature items, Comte that has been aged for 30 months. La Fermette is particularly popular with American tourists as the shop will vacuum pack any products so that they can be brought into the United States (because French cheeses are not pasteurized, non-vacuum-packed dairy items are confiscated at Customs). La Fromagerie, 8 Rue des Petits Carreaux. While the selection at La Fromagerie is far less extensive than that offered by nearby La Fermette (see above), this small cheese shop is usually much less crowded than its neighbor. As such, its knowledgeable owners are able to devote more time to customers, and are happy to recommend new products to try or to help you put together the perfect cheese course. There’s also a fairly extensive (but expensive) selection of French butter. Nicolas, 61 Rue Montorgueil. 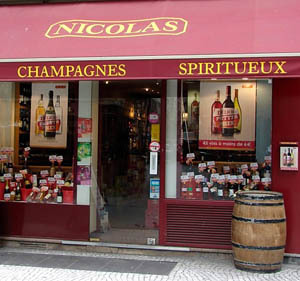 Nicolas is another wine-store chain that operates multiple outlets in Paris and more than 400 throughout France. But whereas NYSA (see below) focuses on exposing non-oenophiles to wine and wine culture, Nicolas, founded in 1822 in Paris, specializes in affordable bottles, with many of its wines priced under $15, and hard-to-locate vintages from all of France’s wine-producing regions. A total of more than 1,200 wines, Champagnes and other alcoholic beverages are available. Staff members speak fluent English and will be happy to help you select a bottle to enjoy on a Parisian picnic or to take home with you (U.S. Customs allows you to bring two bottles of alcohol into the States). NYSA, 94 Rue Montorgueil. 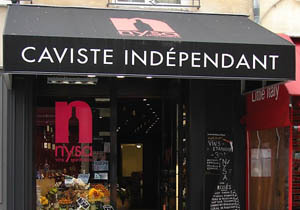 With nine wine boutiques in Paris, NYSA, founded in 2006, can definitely be considered a chain store. But the business’s mission is quite personal: to make wine more accessible and less intimidating to those with limited (or no) experience in selecting the perfect vintage. NYSA carries a staggering inventory, including nearly 450 French wines and 60 Champagnes. Staff members, most of whom are bilingual, are friendly and eager to help educate shoppers about the shop’s products. Palais du Fruit, 74 Rue Montorgueil. 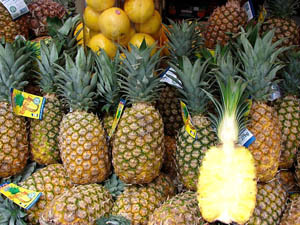 As its name indicates, Palais du Fruit is a purveyor of fresh produce, with an emphasis on fruits. Artful displays of seasonal fruits (and a few vegetables) entice would-be shoppers and visitors eager to snap photos of Parisian markets. And while the products here are fresh and tasty, it should be noted that they are not organic. The shop’s staff also can be quite brusque, particularly when dealing with English-speaking patrons and with the numerous teens and ‘tweens that flood the area when nearby schools let out each afternoon. 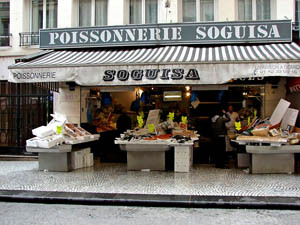 Poissonerie Soguisa, 72 Rue Montorgueil. While the displays of seafood are eye-catching and attract more than a few curious locals and tourists, Poissonerie Soguisa actually gets very poor reviews for the quality—and freshness—of its products. It’s fun for a quick visit or to take photos of the picturesque displays, but buy your seafood elsewhere. And if you are renting a Parisian flat for your stay and do opt to buy seafood here to cook in your temporary kitchen, be sure to cook it the same day that you buy it. Stohrer, 51 Rue Montorgueil. A visit to Stohrer is like stepping back in time to pre-revolutionary France: The establishment was founded in 1730 by Nicolas Stohrer, the pastry chef to King Louis XV. Two of the shop’s specialties—the puits d’amour (love pots) and baba au rhum (a rum-soaked cake)—are still crafted from Stohrer’s original 18th-century recipes. 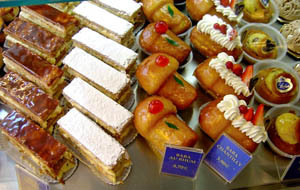 But you can’t go wrong with any of the delicious pastries produced here, or, for that matter, with the rich savory products, including salmon mousse and delicious finger sandwiches. Terroir d’Auvergne, 98 Rue Montorgueil. Founded in 1920, this tiny family-owned shop sells food products from France’s Auvergne region, a mostly agricultural district in the center of the country. 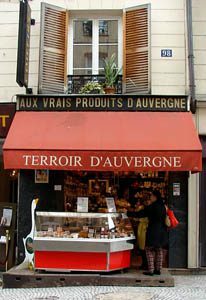 Beef and pork are important foodstuffs in Auvergne, and Terroir d’Auvergne sells fresh imported meat as well as cured sausages and ham. Other regional products include foie gras, terrines, green lentils, Saint Pourcain and Cotes d’Auvergne wines, and several well-known cheeses made in the region, such as Cantal, Fourme d’Ambert, Saint-Nectaire, Salers and Bleu d’Auvergne. This small boutique does not offer vacuum-packing services, so any fresh products you buy here should be eaten while in France as they won’t clear Customs when returning home. Tribolet Alain, 54 Rue Montorgueil. Although Tribolet Alain specializes in Auvergne beef and pork, the tiny butcher shop is well stocked with just about any meat a Parisian cook could ever need. In addition to beef and pork, the bucherie carries lamb, rabbit, duck, pheasant, quail, squab (pigeon) and in-season game, including wild boar. Tourists usually limit their purchases to the roasted chickens turning away in a cooker in front of the boutique (perfect for a picnic) or dried meats and sausages. 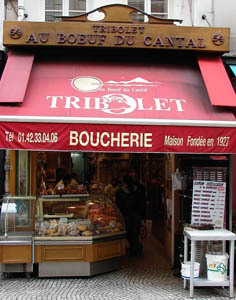 This entry was posted in Boulangeries, Cafes and Bistros, Candy Shops, Famous Paris destinations, Food, Patisseries, Restaurants, Right Bank, Rue Montogueil, Shopping, Sight-seeing and tagged A la Mere de Famille, Boulangerie Collet, Cafe du Central, Delitaly, Eric Kayser, L'Atelier du Chocolat, La Fermette, La Fromagerie, La Grappe d'Orgueil, Le Compas d'Or, Le Comptoir du Commerce, Le Havane, Nicolas, NYSA, Palais du Fruit, Poissonerie Soguisa, Stohrer, Terroir d'Auvergne, Tribolet Alain by Bob Adams. Bookmark the permalink.